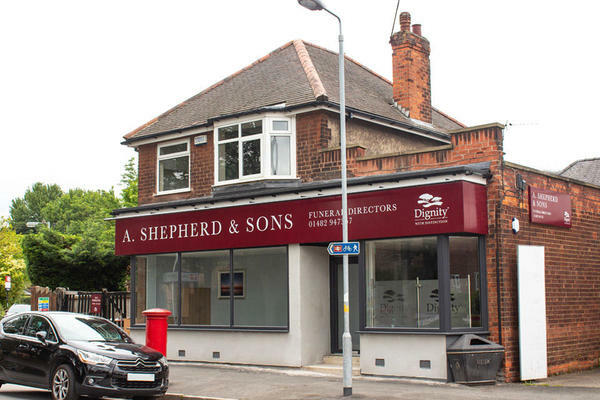 A Shepherd & Sons Funeral Directors in Cottingham, Hull, are here to help you arrange a fitting farewell for your loved one. We believe that life with those we love is deeply personal, and a funeral service should reflect this. We will help you to plan a bespoke celebration of your loved one's life. Our funeral home in Cottingham is easy to reach from the areas surrounding Hull, including Orchard Park and Skidby. We also have a sister funeral home on Beverly Road in Hull. We understand that losing a loved one is never easy, and our dedicated professionals are here to help make things a little bit easier for you and your family. We will work with you to ensure that every aspect of your loved one's farewell is just as you want it to be, right down to the last detail. We are here to advise, guide and support you. You can reach us by telephone whenever you need our assistance. Call us 24 hours a day on 01482 947357. There is on-street parking outside our funeral home. We are on the corner where Beck Bank meets Station Road. Our staff are available 24 hours a day on 01482 947357 if you require our services outside of these hours. Thank you for taking the time to share your thoughts with us. I am pleased that you were so well looked after by our team and we were able to provide you with the care and support needed at this time. The service provided was excellent. Dealt with in a caring manner and nothing was too much trouble.